Emerald Optically Enhanced Neutral Floor Cleaner is a totally synthetic neutral floor cleaner designed for use in a modern floor maintenance program. Its slightly acidic pH will not damage the gloss or film of any finish, and is effective at neutralizing harsh cleaner residue left behind from previous cleanings. Emerald Floor Cleaner contains optical brighteners to enhance the beauty of floors when dry. Its controlled foam formula makes this product ideal for use in automatic scrubbers. 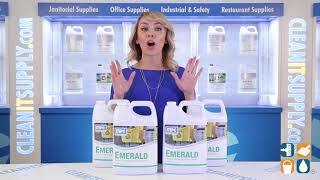 Emerald will dissolve all ice melt and hard water films, never leaving the floor with a soap haze. This floor cleaner has been given high praise by professional janitorial cleaning services as the best floor cleaner that they have ever used. 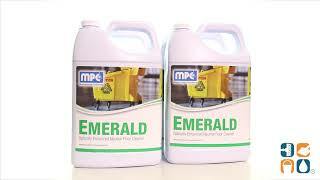 Emerald Neutral Floor Cleaner is ideal for floors in any commercial application, or at home. Call for 55 Gallon Drum pricing. All Misco Products are Readily Available to Ship Fast! Buy Now and Save! Floor cleaner is used in our scrubber at church. Love the smell, and the product cleans beautifully. I would recommend it to everyone who do the same thing I do. This is THE best floor cleaner I have EVER tried. We have porcelain tile floors and live in The Rocky Mountains. Winter time brings in a lot of mess. I used it for the first time this past week and the floors have never looked or felt cleaner. Another bonus? this stuff smells GREAT! not overpowering, not ultra cleany smell, just really nice. I am very happy I bought this. Misco makes great cleaning products. Emerald is probably one of the best everyday floor cleaners. It cleans well and smells good. Most importantly, it doesn't leave any soap film or residue on the floor. We love Emerald because it's essentially goof proof for our employees as you really can't under or over mix it.